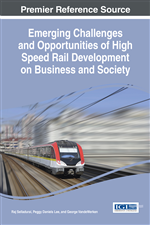 High Speed Rail (HSR) is gaining popularity around the world for a variety of reasons. However, North America lags behind and in particular Canada, where there is no HSR. There has been discussion of implementing HSR in Canada since the 1970s in two possible corridors (one in central Canada and the other in Alberta). In this chapter, the feasibility studies that have been done on both corridors are discussed. In this respect, the focus is on the recent studies, from different sources including the Alberta Legislature, Ontario and Quebec Governments, consulting companies, and a non-profit transportation institute. The factors that influence the viability of HSR are discussed and reference is made to HSR implementations in other countries that could inform the development of HSR in Canada. On a positive note, it appears that the Ontario government plans to move ahead with HSR in part of the central Canadian corridor. Passenger rail is an important transport mode in many countries. Rail transportation is considered more efficient in terms of energy consumption and more environmentally friendly, compared to road and air transportation. Further as discussed later, it helps reduce traffic congestion and other externalities, such as pollution and accidents that arise from excessive road travel and transport. (Van Horne Institute, 2004, 2013). In North America, the railroad network is extensive and transcontinental. However, most of the network is used for freight transport; passenger railway ridership, on the other hand, is lower than in Europe and Asia. For example, as shown in Figure 1, while USA and Canada accounted for 30% of world freight traffic in 2011, the corresponding passenger percentage was 0.33% (International Union of Railways, 2011). The growth of high speed rail (HSR) has been slower in North America compared to Europe and Asia. In Canada, only two feasible scenarios are seen for the foreseeable future. The first is in the southern Ontario and southeastern Quebec corridor and the second is in the Calgary Edmonton corridor in Alberta. HSR was introduced in Japan about fifty years ago and has made great strides in recent years throughout Europe and Asia. HSR provides fast, efficient, and hassle-free service that can compete with air transportation over short to medium distances, especially given the additional inconveniences that air passengers have endured post September 11, 2001. It has also been shown to provide economic benefits to regions served (Bernard, Moxnes & Saito, 2014). The history of the Canadian railway dates back over 180 years, when the first railway in Canada, the Champlain and Saint Lawrence Railway opened outside of Montreal in 1836. Transportation, particularly railways, was an integral aspect of the development of industry in Canada. The laying of a railway line contributed to a place becoming a preferred manufacturing location as it provided that hub cheaper access to larger geographical markets as was the case for the Eastern Townships of Quebec. Prior to railways, the lack of good roads meant that the economy was necessarily local since transporting inbound and outbound material long distances was infeasible. The railways also contributed to manufacturing growth by operating large manufacturing and repair shops (Craven and Traves, 1983). After nearly two hundred years of development, Canada has 31000 miles (49,400 km) of track in total today, of which only 81 miles (129 km) is electrified. The majority of Canada’s railway system uses standard gauge track which is 56.3 inches (1,435 mm), with the exception of the broad-gauge streetcar, the subway lines in different cities and the small lines isolated from the main North American rail network being used in resource industries such as mining or forestry.